What: The Braves hosted both teams, but came away with two losses. 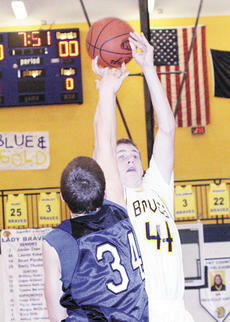 Against Simon Kenton, the Braves rallied from a 21-point deficit to get within seven points. The Pioneers closed the game by making their free throws to extend their lead. James and Linda Humphrey of Versailles are pleased to announce the engagement and forthcoming marriage of their daughter, Jessica Ann Humphrey to Will Jones, son of Roy and Pam Jones of Versailles. 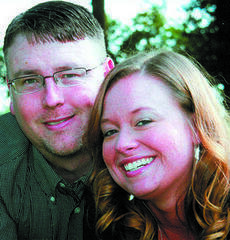 The wedding is planned for 1:30 p.m. on May, 8, 2010 at St. Leo Catholic Church in Versailles. The bride and groom are graduates of Woodford County High School. The bride is a graduate of Sullivan Universtiy and employed by Unified Trust Company, N.A. The groom is employed by Webster Equine Supply. • The Williamstown Kiwanis will meet at noon Feb. 3 at El Jalisco Mexican Restaurant in Williamstown. • The Order of the Eastern Star No. 301 will meet at 7:30 p.m. Feb. 4 at Masonic Lodge No. 85 in Williamstown. • The Crittenden/Dry Ridge Masonic Lodge No. 694 meets at 7:30 p.m. Feb. 6 in Crittenden. Call Jerry Keith at 859-393-5169 for more information. The Williamstown girls’ basketball team bent, but never broke. 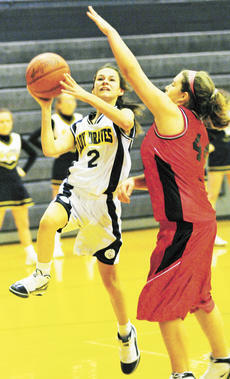 The Lady Demons faced their county rival Grant County and built a 16-point lead heading into the fourth quarter, leading 39-23. The Lady Braves were able to chip away at Williamstown’s lead, eventually tying the game at 43 after GCHS senior Dawn Plunkett hit a three-pointer with less than two minutes left. The Kiwanis Charity Auction is set for Feb. 4 and Feb. 5. There is an almost official list of items elsewhere in this newspaper that you are now holding, or online at grantky.com under Marketplace. A couple items are changing and the Kiwanis members are still adding to the list. The Grant County varsity cheerleaders knew that to be at their best they would have to shake off their nerves. Last week while the squad prepared for the JKD Competition at Bourbon County High School, they had several drops that they knew they could not afford in an actual competition, especially because the KAPOS eighth region competition was a week later. The girls were able to stay focused and earned first place in the medium division on Jan. 23. On the verge of becoming the #1 ranked team in the country for the first time since 2003 with a win over Arkansas, the Kentucky Wildcats delivered their most dominating performance of the season to remain the lone unbeaten in all the land. Coach John Calipari, who has been known to downplay the play of this team at times this season, described the performance this way. "I think we would have smashed anyone in the country today. That's not arrogance, but that's as good as we've played for the first 20 minutes. We would have beaten a lot of teams today." 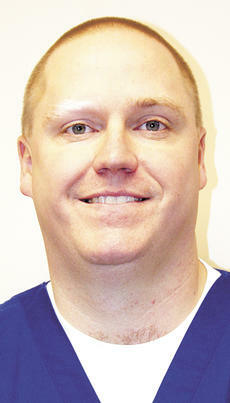 Stephanie McKee and Bud Wayne Vance of Glencoe would like to announce the birth of their first child. 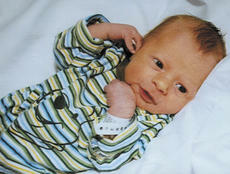 Justin Wayne Vance was born at 10:33 a.m. on Nov. 17, 2009 at St. Elizabeth Medical Center in Florence. He weighed 5 pounds and 10.1 ounces and was 19 inches long. 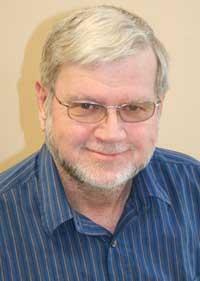 His maternal grandparents are Harold and Janet McKee of Dry Ridge. His maternal great grandparents are Lowell and Elizabeth Thomas of Dry Ridge; Bill and Mildred McKee of Salt Lick; and Bob and Sue Whalen of Falmouth. Demons earn win against Trimble Co.
What: Coming off of a win over Walton-Verona, Trimble County hoped to earn another win against a 32nd district team. The Demons had three players score double-digit points, as junior Derrick King led with 17 points, senior Storm Mason scored 16 points and sophomore Jake McKinley added 10 points. Williamstown also made the most of their free throw attempts, hitting 22 of 29 free throws. The seventh grade Lady Braves’ basketball team had high expectations heading into this season after finishing last season 12-5 with a second place finish in their conference tournament. Some of their goals heading into the season were to win at least 80 percent of their games and to have fun. Through 16 games, they are well on their way to achieving their goals with a 13-3 record.